Reform Social & Grill has a presence in London and Dubai, with the restaurant in London being housed within the Mandeville Hotel. The restaurants pride themselves in providing a British experience, offering a complete experience of afternoon tea, brunch and an a la carte menu that showcases a number of British classics. The décor of Reform Social & Grill London was tasteful, taking its inspiration from a traditional British gentleman’s club. There were a variety of photos and prints, eclectic without being impersonal. The seating was comfortable with a mix of tables and chair and dark leather booths. There was punk-era music playing in the background at a suitable volume, non-intrusive until you take the time to notice. The menu opens with a variety of sharing platter options to suit all palettes: fisherman’s platter, baked cheese platter, butcher’s platter. 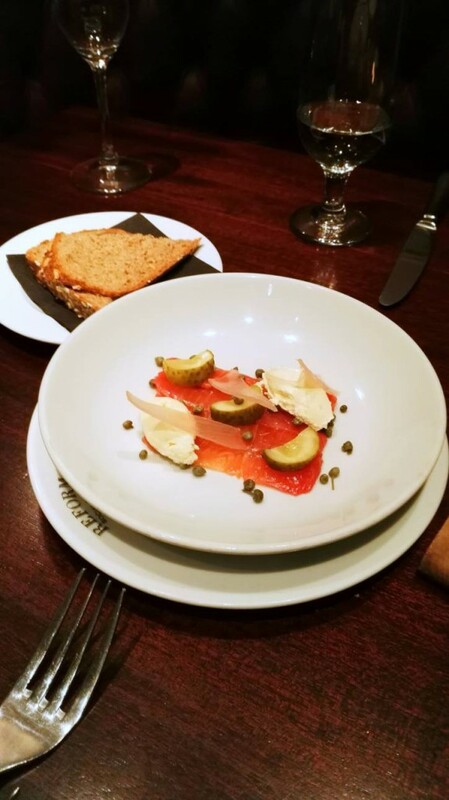 Starters followed including Crispy South Coast Squid, Chicken Liver Pate and Hendricks Gin Salmon. Along with salads, classic main dishes including Fish and Chips and Braised Ox Cheek Pie are offered alongside some “Josper Grill” specialties. 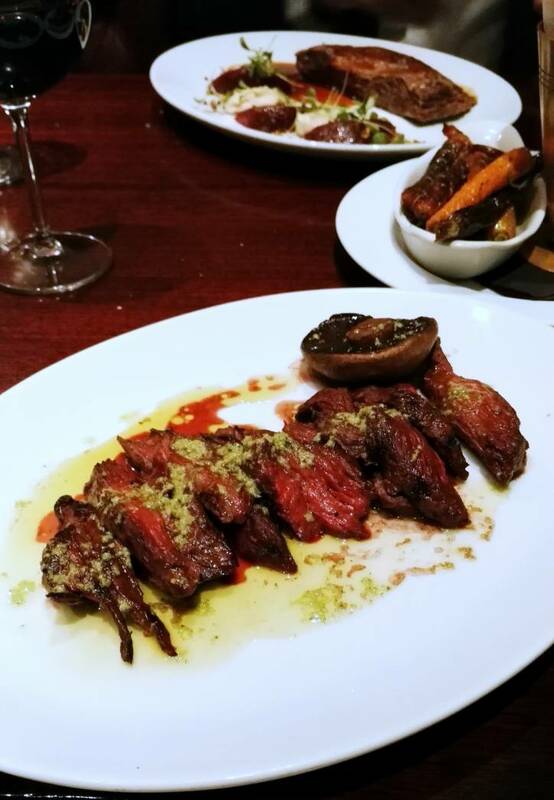 We feel that people who utilise Josper Grills mean business so we looked no further, feeling spoiled for choice with a range of meats: Burgers, Glazed Beef Short Rib, Minted Lamb Cutlets, Butchers Steak, Rib Eye Steak, and Pork T-Bone. There was a reasonable selection of wines by the glass on the menu and we started the evening with a couple of glasses of Chapel Down Brut, English Sparkling Wine. We enjoy finding English wine more frequently on restaurant menus, and it certainly holds its own against the fizz from the continent. Bread arrived at the table and these were nothing special, nor were they a representation of the meal to come. To start we had the squid (£7) and the salmon (£7.50). The waiter brought a small glass of gin to accompany the salmon which was presented as thin slices with a creative ‘tartare dressing’. The salmon was firm with delicate flavours and, when eaten before a sip of gin, the gin was far more fragrant and palatable than it would be if drunk neat. The ‘Tartare’ was broken down into separate elements: scattered capers, gherkin and heavily whipped cream placed on top of the salmon. The concept had potential, but the cream masked the salmon’s taste. If the cream was infused or flavoured in some way, perhaps this effect could have been dampened. 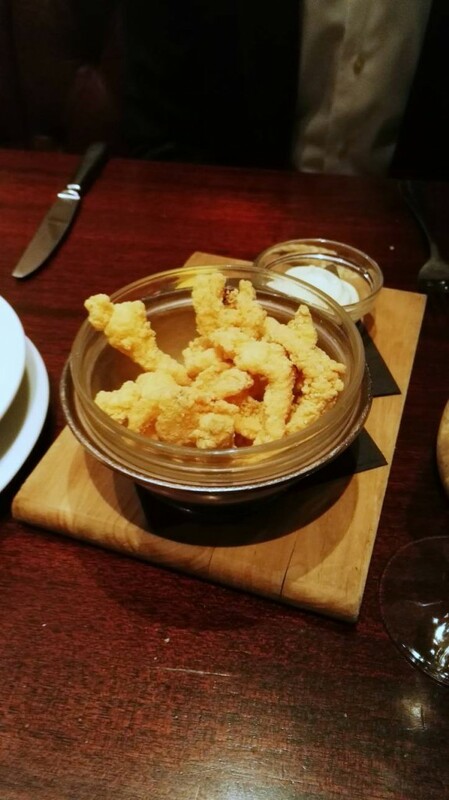 The squid was a good sized starter portion and well cooked. It had a little bite to it and a crispy coating, and was not greasy, chewy or rubbery. It was perfectly seasoned too, and the mayonnaise was light. 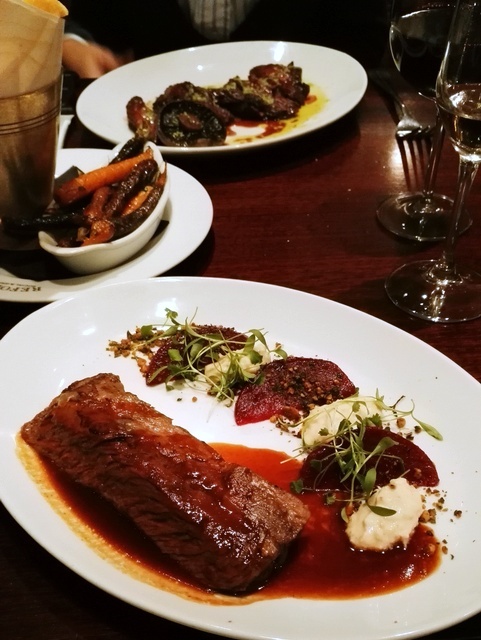 Our mains were the Beef Short Rib (£18.50) and the Butchers Steak (£16.50). The waiter suggested a Malbec to accompany the mains, and it was a good choice. The wine was deep purple with lots of dark fruit on the nose. It was very smooth and full bodied, the flavours complementing, yet not overshadowing the food. It was the first time we’ve been presented with Short Rib off the bone. It was perfectly cooked, with the meat being tender throughout and accompanied with a sweet but not overpowering glaze. It was served with beetroot and horseradish – again showcasing another classic British pairing. Butchers (or Hanger) steak is not a cut we frequently go for, but this was the best-cooked we have had to date. Perfectly medium rare, tender, and the garlic / chimichurri style sauce on top went well with it, and again did not overpower the flavour of the meat. 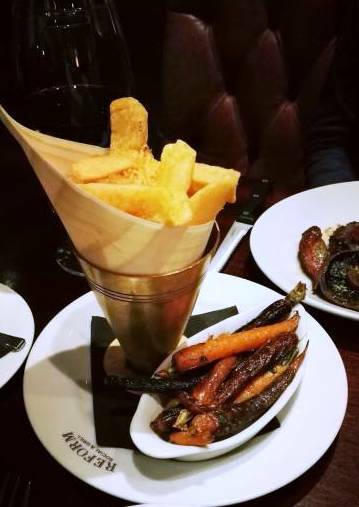 The steak was served with traditional chips and we also chose a side of roasted heritage carrots (£3.50). Both perfectly cooked, though there is always the debate of whether the alternative option of fries should be provided. The choice of desserts would not have disappointed those seeking British classics: sticky toffee pudding, apple crumble, ‘reform’ mess to name a few. There was also a small but fine selection of British cheeses available. We ordered a glass of Semillon to accompany an apple and berry crumble (£6.50) and Tunworth cheese from Hampshire (£3.95). Our attentive waiter suggested a glass of Sauvignon Blanc to accompany the cheese. Again, it was an excellent suggestion. The apple and acidic fruit of the wine complemented the soft cheese very well. 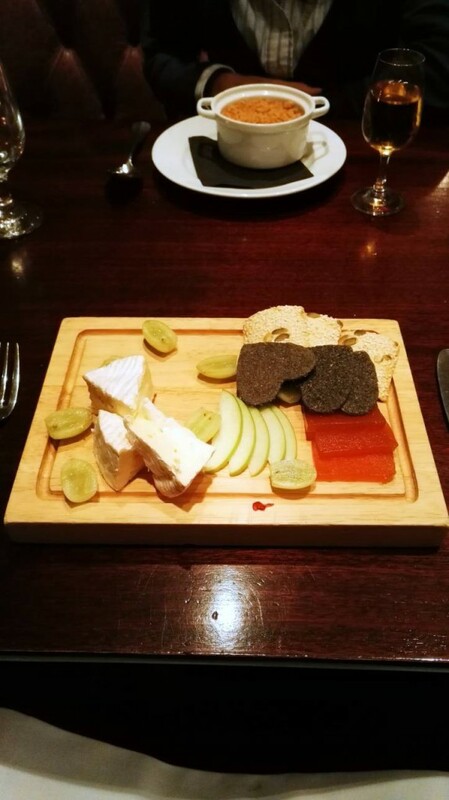 It was served with green apple and grapes and a fine selection of crackers, although the quince jelly was a less apt companion to this particular cheese in our opinion. 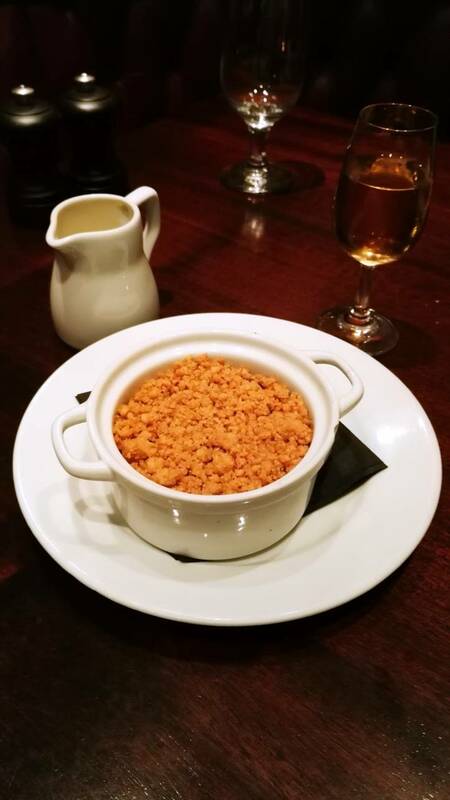 The crumble was great – a good mix of sweetness and crisp from the crumble to complement the cloying texture and acidity from the fruit. The custard was a good consistency with hints of vanilla – a fine complement. The service was friendly, polite and attentive. There were a couple of small misunderstandings when we were ordering, but these were quickly rectified. Overall we really enjoyed our meal at Reform Social & Grill. A guest post by ‘O&M’ – a husband and wife team brought together through their mutual and growing appreciation of food and travel. Their conversations revolve mostly around food and their trips abroad include walking itineraries to as many food venues as they can fit in. In their spare time they are slowly eating their way through London and the World before their metabolism takes notice.